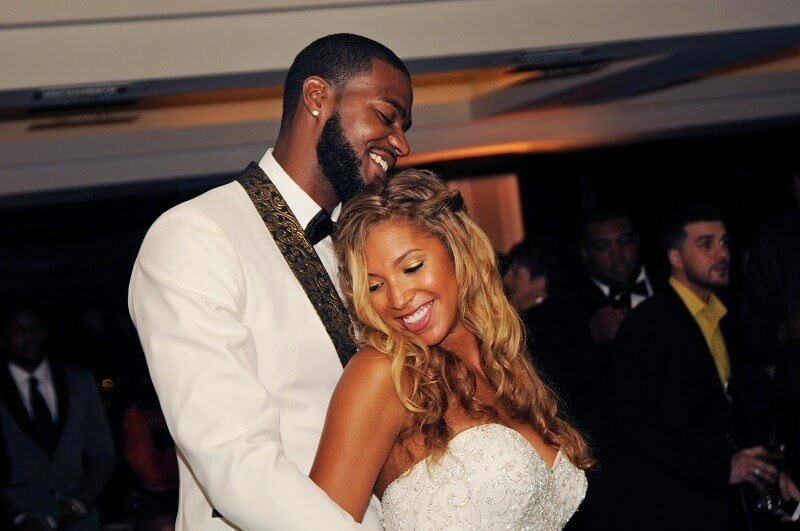 Former University of Louisville standout basketball forward Earl Clark came back to Louisville to marry his bride, Megan, in the wedding of their dreams. The pair, who had dated since they were UofL students, were married in a simple civil ceremony in 2012. But in August 2014, they made it official with a magical wedding that was truly worth the wait! Bad weather on the day of the wedding did not dampen the mood. While all pictures were scheduled to be taken outside, a quick change of plans by photographer Adele Reding and wedding planner Marcie Hancock resulted in gorgeous photos set inside their wedding venue. In an interesting twist, everything about the wedding had to accommodate the height of the wedding party, and even some of the guests. The groom is 6 feet 10 inches tall, and the bride is more than 6 feet tall, as well! Therefore, the cake had to be extremely tall, and even the chandeliers in the ceremony room had to be removed so the wedding party would not hit their heads. Like true sportsmen, this couple is a team in every way. They have been constantly on the move since their college days, moving through the NBA circuit from town to town. Currently living in China, they will be moving back to the states later this spring. Until then, though, they were thrilled to be back “home” for their wedding and to spend their special day with their family and friends. Oh my, this ring! When the wedding planner went to get it cleaned, she hired security detail to accompany her. True story! Megan needs a team to help her get dressed in this beautiful gown with a fitted bodice and flared mermaid skirt. Watching the rain and enjoying the view from the Galt House, Megan shows off her beautiful skirt and train. Megan, her mother and sister enjoy a private moment before the ceremony. This dapper groom enjoys a brief hint of sunlight in his white dinner jacket with black and gold lapels. Posters of Earl Clark during his days at the University of Louisville were hung in the groom’s suite. The groom and his wedding party … note their proximity to the ceiling. Each groomsman had customized Chuck Taylor shoes with their initials on them. Earl Clark before the ceremony, taking a picture in the luxurious reception room. The ceremony took place in the Waterford Room at the Galt House. All chandeliers were removed to accommodate the height of the wedding party. More than 450 orchids were placed throughout the space. Bridesmaids’ nosegays are shades of blush and cream. Megan’s parents walk down the aisle. Megan’s father wore his full military dress uniform. Earl, you may kiss the bride! Megan and Earl share a tender moment that they have waited years to enjoy. Fellow basketball players were at the wedding. Former University of Louisville player Peyton Siva was supposed to be there with his wife, Patience. He arrived alone, though, as Patience was getting ready to have their baby the next day. The wedding colors were black and gold, reflected here at the guests’ tables. Note the incredible view from the top of the Galt House at Rivue. The cake is the perfect size for them. The groom’s cake honored his favorite drink. A tender moment between the bride and groom on the dance floor. Guests enjoyed a fancy dessert bar. Earl and his family. Please note that his father is taller than he is. The bride changed at the end of the night into a beautiful gold-beaded gown. The photo booth was a huge hit for the guests, who were obviously loving the props. Congrats, Earl and Megan! Here’s to a lifetime of happiness!